The last few days have been quite tense in Aragua State, as an undeclared conflict between criminal gangs and the authorities heats up. 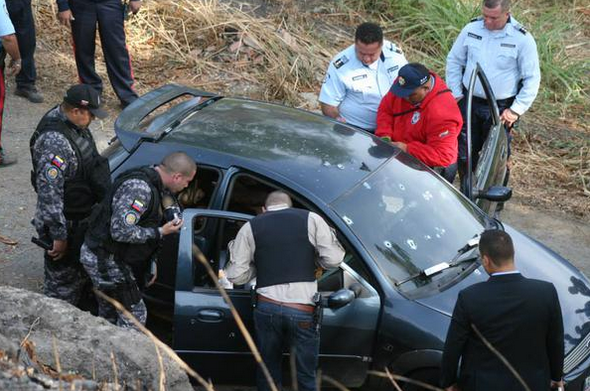 It all began last Thursday when six members of the criminal gang known as “El Kilverth” (named for the leader’s alias) were killed in a shootout following their attack on a local police station near San Mateo, close to the capital city of Maracay. Three of the gang members died after a live grenade went off inside their vehicle. Hours later, came the retaliation: three offices of the CICPC (Criminal Investigations Police) were destroyed by coordinated grenade blasts. The CICPC declared a maximum state of alert. Over the weekend, agents from local and national forces (including the intelligence service SEBIN) have increased their presence in the area and carried out several raids to find those responsible. This could include other criminal groups active in the area. In recent months, violence has increased in Aragua (specially in small towns like Turmero and Villa de Cura), reaching the point that local opposition legislators have asked both the State government and the Interior Ministry to declare a state of emergency. The thing that caught my attention has been how the gangs have easy access to grenades. Incidents involving this type of military weaponry are becoming more and more common. Even tear-gas canisters (used for riot control) are falling into the hands of folks that really shouldn’t have access to them. With our criminals having both war-ready equipment and a huge supply of bullets, police officers and civilians are on the losing side. This recent story by NPR’s John Otis on policing in Petare confirms the trend – grenades galore. The central government prefers to blame violence on drug traffickers and politically-motivated paramilitaries. But that view isn’t that far from the truth: these criminal gangs sort-of fit the basic definition of a paramilitary body, and many of those groups (such as the infamous “El Picure” gang) are involved in drug-related activities. However, the political angle the government desperately wants to stick onto the problem simply doesn’t match the evidence available. Our crime epidemic is surpassing all estimations, to the point that Venezuela is (according to the Brazilian think tank Instituto Igarape) the second most murderous country in the planet. If you are being murdered, there is a high chance you are in Venezuela. UPDATE: Related to the issue of delinquents’ recent love of grenades, check out this brand new article by Thabata Molina. Very informative. Next article"We don't trust voting machines"